1. Support IEEE 802.3af for PoE. 3. High output power provides you larger wireless range. 4. 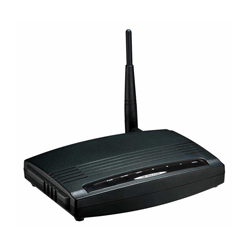 IEEE 802.11b/g wireless compliant with 54Mbps high-speed data rate. 5. Operation modes: AP, client, WDS, AP+WDS. 7. Wireless users access control. 8. Wireless security-64/128bit WEP (802.1x), WPA/WPA2/WPA2 mixed and WPS. 9. Support WPS via PIN and PBC. 10. Quick and easy setup wizard with web-based utility. 11. Detachable antenna allows user to replace higher gain antenna. 1. Standard: IEEE 802.11g; IEEE 802.11b; IEEE 802.3af. 2. Frequency band: 2.400~2.4835GHz. 3. Radio type: IEEE 802.11g ─ OFDM (64-QAM, 16-QAM, QPSK, BPSK); IEEE 802.11b ─ DSSS (CCK/DQPSK/DBPSK). 4. Data rate: IEEE 802.11g ─ 54, 48, 36, 24, 18, 12, 9 & 6Mbps; auto-fallback; IEEE 802.11b ─ 11, 5.5, 2 & 1Mbps; Auto-fallback. 5. Access protocol: CSMA/CA. 6. Number of operation channel: U.S. 1-11; Japan 1-13, 14; elsewhere worldwide 1-13. 7. Operation mode: AP; client; WDS (Wireless Description System); AP + WDS. 8. Security: 64/128bit WEP; WPA, WPA2, 802.1x, 802.11i; WPS. 9. Max. RF output power: 802.11b: up to 29 ±1dBm (800mW); 802.11g: up to 26±1dBm (500mW). 10. Sensitivity: -68dBm @54Mbps; -80dBm @11Mbps. 11. Antenna: one detachable antenna (5dBi; Male SMA reverse). 12. Dimension(mm) & weight: 165(L) x 118(W) x 27(H); 230g. 13. Humidity: 10~90% (non-condensing). 14. Temperature: (1)Operation: 0~50°C. (2)Storage: -20~60°C. 15. Connector: antenna connector x1; RJ-45 port x1; WPS button; Reset to default button; Power jack 16. Power requirement: AC12V/1A or PoE.